You may actually find this story, of how an ‘early version’ of this course (ACIM) was discovered in 1999, quite interesting. It was this discovery that blew the Course Community-wide open! For years, students believed they were studying what the scribes (Helen Schucman and her co-scribe William Thetford) had written, but that was not so. For 7 years, Helen and her boss, William Thetford, took down what she was hearing from an internal VOICE, which described itself as JESUS. This was embarrassing and disconcerting to Helen, but on some level she knew she would take this material down. She said she wouldn’t necessarily ‘do’ what it said, but if it made any grammatical errors she was done! Shortly after this Helen and Bill met Ken Wapnick who thought that the manuscript should be edited further which they did. In 1975 the Course was published and copyrighted, with the acknowledgment that it had been edited by only minor changes in titles, subtitles, and punctuation; in other words nothing major. In 1992 the copyright holder started to enforce the copyright stringently and a few years later entered into a multi-million dollar lawsuit against a spiritual community which was ‘quoting’ the Course out of context. The spiritual community that was sued had very little funds and were represented only by the lawyers who lived in the community and who offered their services, Pro Bono. The spiritual community lived the theories of ACIM and came from unconditional love for ALL involved -> Judge, Plaintiffs, Defendants. ALL. I don’t think the Judge or anyone in the courtroom knew what hit them. It was LOVE. The copyright was overturned in 2003. The most amazing part of this whole story was that during the ‘discovery’ phase of the trial, the early 1972 manuscript given to Hugh Lynn Cayce was located, digitized, and put up on the Internet. 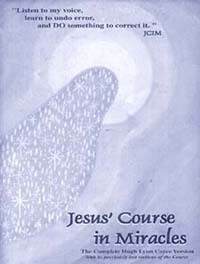 Realizing the beauty of this material and wanting to get it out into the world, Thomas E. Whitmore, a lawyer in Omaha, along with a few Course in Miracles students, formed a non-profit organization, Course in Miracles Society [CIMS] and published this manuscript under the name, “Jesus’ Course in Miracles” in 2000. They were presented with a restraining order and entered into the litigation as well. If the Course has crossed your Path, it’s not an accident. It’s your REALITY telling you it’s time. Course in Miracles Society [CIMS] is an international group of Course students and teachers organized to discover, authenticate and propagate the Divine Teachings of A Course in Miracles. As students, we seek to increase our knowledge of Jesus’ words and to deepen our experience of His teaching. As teachers, we work to circulate the message of A Course in Miracles throughout the world by our words, deeds and by the example of our lives. Presently all CIMS projects are wholly supported by free will gifts of time, talent, and money. If you would like to support any of the activities of the Society in any way, please do not hesitate to get in touch. Because of the international character of CIMS, the internet is our primary means of communicating and collaborating.